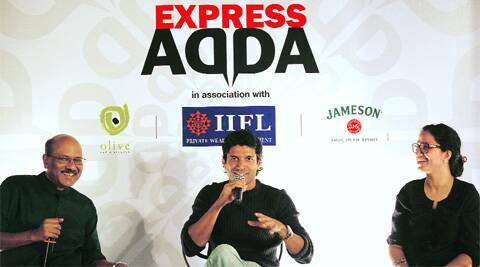 At the recent Express Adda in Mumbai, Farhan Akhtar spoke about his creative process, his transition from director to actor, and being Milkha. At the recent Express Adda in Mumbai, Farhan Akhtar spoke about his creative process, his transition from director to actor, and being Milkha. He even entertained the audience with poetry and song. At the latest edition of Express Adda, presented by Yes Bank in association with India Infoline Finance Limited (IIFL) and Olive Bar & Kitchen, held in Mumbai recently, Bollywood actor-director Farhan Akhtar was at his candid best. During a conversation with a select audience, moderated by Shekhar Gupta, Editor-in-Chief of The Express Group, and Priyanka Sinha Jha, Editor of Screen, Akhtar spoke about his family, co-actors, how he approaches his craft, and his transition from a director to an actor. In my earlier years, I couldn’t commit to anything; whatever I’d take up would last for a month or two, including college. I lived with my mother and she used to be very distressed with my behaviour. Later, when I thought of a career in films, I felt my strength lay in writing, not acting. It’s important to be honest with yourself and know whether you are good and ready enough to do it, because it’s not a job in isolation, there are other people’s lives and careers on the line. But working closely as a director and writer with talented people such as Aamir Khan, Dimple Kapadia and Amitabh Bachchan, I learnt about character building, and how they approach their craft. That helped me in transitioning to an actor. Lakshya taught me an important life lesson — it is not up to you if your film does well. I had expectations from Lakshya because we had worked hard in making it. But I learnt that once the film is out there, it has a life of its own and as hard as you worked or as lax as you’ve been, people will like the film for what it is. Dil Chahta Hai isn’t just about being unabashedly rich, it’s about being unabashedly who you are. I wrote about the world and the people I knew, the kind of friends I had, something no one was doing at that time. So many people, like me, had stopped watching Hindi movies. We’d prefer watching international releases on DVD or in theatres, so probably it was in the spirit of protest that I wrote the script and made that film. I must thank all the actors who refused to play Milkha Singh before me; I was sold on it in the first 20 minutes of the story’s narration. Working on the film taught me that there is potential within each human being to achieve anything they set their mind on to if they’re willing to sacrifice luxuries and remain focussed. That’s the message Milkha Singh wanted conveyed through the film. I remember our first meeting at Priyadarshini Park in Dadar, Mumbai, where I was training for my part. When he came to the track, there was an electric energy as soon as he entered. All the young athletes training there started touching his feet. He, too, was interested in what sport they were participating in. That was the day I truly realised the importance of this movie, and that worked as a motivation to get his story right. As an actor, it depends on what is being asked of me. For instance, for Karthik Calling Karthik, I locked myself in a room for roughly a month before we started shooting. I didn’t want to speak with anybody so that I could start having conversations with myself. But when I’m writing, I tend to lock myself alone. That’s unlike my father who can write no matter what is going on around him. I have witnessed this in a studio, especially when he’s writing lyrics. There’s music, people around are chatting, but he’s lost in his own world. When I am writing a scene, I always imagine the background score. Films have a certain tempo in storytelling and there is a beat the ascreenplay follows — like any piece of orchestral music, there will be highlights, a lull, going-down tempo for a while and maybe then the grand finale. So when I am watching an edit, reading a scene or getting ready to perform, I always have some kind of musical references to create the mood. For instance, to shoot for Milkha Singh’s final race in Patiala, we were on the sets without rehearsal, and the tune from The Last of the Mohicans started playing in the back of my mind. There is a big crescendo in the end where I imagined him running across the finishing line; it really helped. Our initiative MARD is not an NGO. It’s a behaviour and value initiative where we want to get children and young adults to understand the importance of gender equality. It is a message we predominantly take to educational institutions through concerts. The children of today will be in various fields occupying various positions of power in the future. How they think is going to influence everyone who comes after them. Apart from that, we have tied-up with Magic Bus, an NGO that reaches out to slums across India, to help in the education of the girl child. All the money I make through the concerts goes into this. Hopefully, when I am really old, these problems would have sorted themselves out, and we won’t have to talk about it anymore. As part of the MARD initiative, I also wanted to follow up on Milkhaji’s dream. Through Magic Bus, I will sponsor two boys and two girls to track-and-field, who can eventually represent the country on the global stage. The people I worked with on the film are talent scouts who go all over India looking for people who run well. So we’re looking for four children who we can nurture with regards to sports and education. I get nervous before I get on the stage, but once I’m there and start to sing, I surrender to the moment. There’s a connection that happens, with music, the band and the audience. You can tell when something is not right and move on, you can get them to sing along. That exchange is very honest. About 10 days ago, while playing volleyball with some friends, I landed on a player’s elbow and injured myself on the side. The muscle was swollen and the doctor suggested I rest. Since then, I have done three concerts. It hurts before I get on the stage and also an hour after I’m done, but when I am there, I don’t feel a thing. We don’t argue about films because he has his own views on movies that he has watched, much like on other subjects. The reason he has sustained so long in the film industry is because of his ability to listen to emerging talent. He never speaks to anyone from the position of knowing it all. He loves a good discussion and a good debate, but it never becomes an argument; it’s always witty and in good spirit. Zoya (Akhtar, sister) and I have imbibed all our basic values of who we are, from my mother. She’s a more well-versed audience than I ever hope to be and watches everything that releases. She’s also an avid collector of films, so my initial exposure to a lot of filmmakers was through her collection. She started working at the age of four as a child artiste, so we are all very happy that she is now taking some time off. I have worked with her on a short film on AIDS awareness. I was very nervous because that was one time when whatever happened on the set could go back home. But she’s amazing and a thorough professional. She is one person I can go to with whatever I write because I will have to think many times before I do. Once, just after Dil Chahta Hai released, a big director called me for the screening of his film for my honest feedback. I took it on as a very serious responsibility, but by the end, I didn’t like the film. I thought I would sneak away, but as I was heading off, he saw me and called me over. When I told him what I thought of the film, he said he’ll call me the next day to chat. He never called of course, and shortly after, I heard that he was using the choicest words to describe me to everyone he met. After this incident, I stopped going for screenings.